OM VISA Consultancy - Global Immigration, Students, Visitor, Business & Work VISA Consultants: Study In UK, With Low Tution Fees, Low Academics, Scholorship Available, CLimb The Ladder Of Your "Goals" . Come To "OM INTERNATIONAL"
Study In UK, With Low Tution Fees, Low Academics, Scholorship Available, CLimb The Ladder Of Your "Goals" . Come To "OM INTERNATIONAL"
Middlesex University London is a public university in Hendon, north west London, England. It is located within the historic county boundaries of Middlesex from which it takes its name. It is one of the post-1992 universities and is a member of the Million+ working group. As is the case with many former polytechnics, Middlesex can trace its history back to the 19th century, yet was not formally organised as a teaching institution until 1973. Since 2000, the university has been reducing the number of campuses dotted around London's North Circular Road in an effort to cut costs by consolidating most of the university at the flagship campus in Hendon. As of the 2013 academic year, its estate strategy which has cost £150 million has concentrated the university on one site in north London. In 2012, the university re-structured its academic schools to align them more closely with the needs of industry. 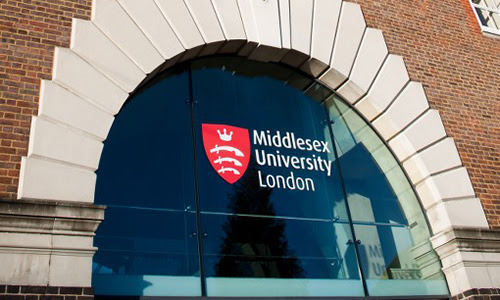 Courses at Middlesex are now delivered by the schools of Business, Law, Art and Design, Health and Education, Media and Performing Arts and Science and Technology, alongside the university Institute for Work Based Learning. For nearly 140 years Middlesex University London and its predecessor institutions have been home to innovators and change-makers. We boast one of the most diverse communities of students and staff of any university in the UK, with almost 19,400 students and 1,900 staff from 140 different countries at our modern north London campus in Hendon. We are proud of our achievements in teaching and research. In 2017 we received a silver award for high-quality teaching in the government's new Teaching Excellence Framework (TEF). We also became the highest-ranked modern university in London in the Times and Sunday Times Good University Guide. Over 91% of our students are in employment or further study six months after graduating. To achieve this, we work with employers to make sure that our students learn what employers need giving them a solid foundation for inspiring careers. Minimum 55% or above from a local Board Examination or its equivalent. Minimum 50% or above in a degree from a recognized institution or its equivalent. 70% in class XII English subject (Indian ISC and CBSE) Examination Board/ Higher Secondary State Boards. Tuition fees are correct at time of printing and are subject to change. Talented students may be eligible for the Merit Award, and earn rewards of up to 50% reimbursement of their tuition fees for all taught UG and PG courses. Five full scholarship awards available to South Asian Postgraduate students who have demonstrated academic excellence. High achieving students can apply for scholarship worth €5,000 towards their studies. The Chevening scholarship scheme offers financial support to study for a postgraduate course in the UK.